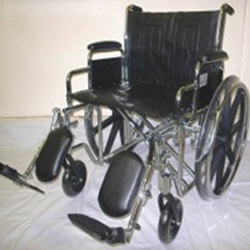 MR WHEELCHAIR BIG T - 22" - 24"
The Mr Wheelchair BIG-T has reinforced frame and axle housings to carry weights up to 200kg. With an ever increasing demand for wider wheelchairs, the BIG-T has become very popular in the private and hospital markets. Available in 22" and 24"